So here’s a look at some of the men whose painfully-protracted transfer sagas are likely to dominate media narratives this summer: players whose exorbitant transfer fees we’ll either be laughing about or lauding this time next year; cheaper options whose progress is worth keeping an eye on; a crop of youngsters so good they’ll leave you questioning how the striker could have ever been declared dead; and just a jolly good chance to acknowledge the entertainment value of speculation. Whether such media pressure lifts them to the status of icons or causes their careers to crash and burn is another story all together. Not only is Borussia Dortmund’s Polish striker on top form at the moment, he’s also on top of the world. His consistently good performances and potency have long made him the subject of transfer speculation—and what better way to put yourself in the shop window than by helping yourself to four goals in a Champions League semi-final against Madrid? Imagine how different his career might have been had Iceland’s volcanic ash cloud not forced him to cancel his trip to watch Blackburn play back in 2010 when he was still contracted to Lech Poznan. His career might have taken several different paths, actually, were it not for the stunning lack of foresight shown by Legia Warsaw. So it was off to Lech Poznan he went, where he was duly scouted by and eventually moved to Dortmund. Speculation about what’ll happen to him this summer has been partly generated by his quality displays over the past few years but fueled in the last month or so after his agent told Bild that they had ‘reached an agreement with a club and intend [him] to move this summer’. On top of this, Bayern keep dropping unsubtle hints about him, and now Klopp is telling us he wont be sticking around. Lewandowki’s obvious potency is one attraction, but it’s likely that anyone buying him is also interested in his ability to press effectively. Klopp’s unique take on pressing—gegenpressing—has been a major contributing factor to Dortmund’s success over the past few years, and tends to mean that the striker is tasked with constantly closing down the back three or four of the opposing team. As the rate of teams improving their pressing game continues to outstrip the readily available strikers who are able to press well, someone like Lewandowski is in even higher demand. Affluent clubs with buckets of ambition have contributed an immeasurable amount to the progress of football over the past two decades, but they also have their downsides—and stockpiling promising players in the hopes of making squads competitive or increasing depth is one of the most damaging. Džeko has been relegated to the bench for most of this season at Manchester City, with Sergio Agüero starting ahead of him. Although incredibly effective as a super sub this year, Džeko has made it clear that sitting on the bench is not where he wants to be. With a Bundesliga title already under his belt with Wolfsburg, it wouldn’t be outrageous to put him forward as a candidate to replace Lewandowski at Dortmund. The athleticism and level of fitness that are prerequisite to play in the Premier League would make it unlikely that Džeko would have problems adopting to a side who are as industrious as Dortmund. I’m sorry for talking about pressing so much, but that’s one of the major reasons Gomez is currently only second-choice at Bayern. One might reasonably expect one of the darlings of German football to be at a club where he was first choice, but Mario Mandžukić’s superior pressing skills are locking Gomez out. Mandžukić is also better at playing fluidly with Ribery, Kroos, Müller and Robben, drifting out to the wings or falling back into the number 10 position to allow one of the other attacking players to move into the striker’s position. This is also the reason you’ll see Klose start ahead of him or the German national team sometimes. Gomez is undoubtedly one of the best poachers in the game, but seems almost anachronistic at Bayern. I don’t want to fault him too much, because after all, he is one of the best strikers in the world and has 17 goals from 31 appearances this season, many of them as a substitute. As with Džeko at City, its frustrating to see a player so good start on the bench—especially one who could secure a place with ease in any other team in the world. Gomez did take a season or so to settle in when he first moved to Bayern, but that probably will happen when you come for over 30 million euros to the best club in the league at a relatively young age. With plenty of experience at the highest level, though, he’d likely settle down quicker into any new club. Real Madrid’s general manager Jose Angel Sanchez has confirmed that Higuain will be leaving the Bernabéu this summer, after six and a half seasons with the club. Unfortunately for him, the story of his move is likely to be eclipsed by the saga of who his replacement will be. Despite having over 100 goals in La Liga, he’s recently had to share the spoils with Karim Benzema as part of Madrid’s revolving cast of strikers. As with others on this list, Higuaín is another player who would benefit immensely from regular first team football at a high level, and at only 25 years old will be an attractive buy for plenty of clubs. I always feel anxious when I see Eredivisie strikers move to bigger leagues. Last year’s Eredivisie hot property Bas Dost is having a below-average season at Wolfsburg, and Luuk De Jong, who was also the subject of much attention, is having a ‘decent’ season at best after a big money move to Borussia Mönchengladbach. The season before that top scorer Björn Vleminckx attracted Club Brugge, where he only managed nine goals in almost forty games. The season before that, though, it was Luis Suárez plucked from the Dutch league based on his prolific scoring, in 2008 it was Klass-Jan Huntelaar and in 2006 it was Dirk Kuyt, so we’ll just keep our fingers crossed that Bony takes the lead of these latter players and not the Eredivisie’s more recent examples! The Colombian is in a difficult position. He’s so good that he’s pushed himself into that price bracket where only five or six clubs could afford him (Neymar was there too). Luckily for him, at least a couple of those clubs actually do lack strikers, and two of them just so happen to be playing in the same league he’s flourishing in. Colombia legend Tino Asprilla has told him to pack his bags for the red side of Manchester (and the Daily Mail have helpfully ‘imagined’ what this might look for the occasion, just in case your own imagination can’t stretch that far). 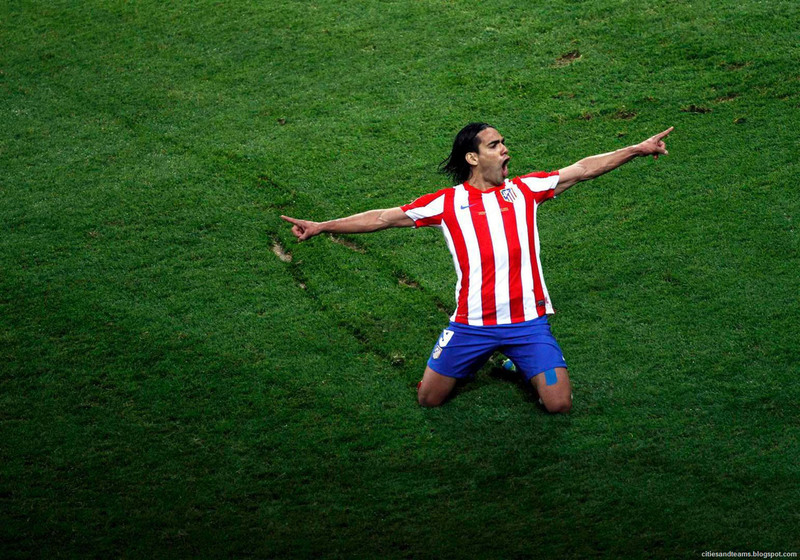 Diego Simeone said he’ll back Falcao wherever he goes, and certainly seems resigned to losing him this summer. 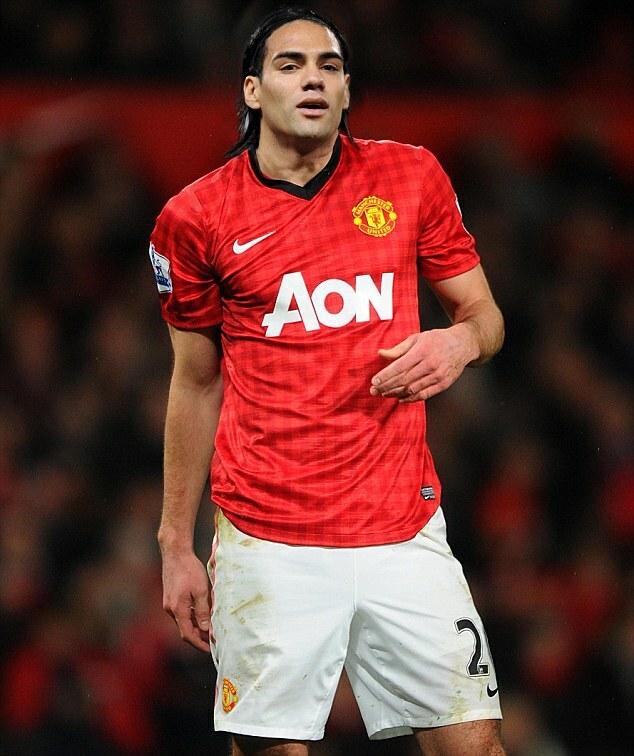 Inevitably, he has been linked to United and every other big or rich or big and rich club imaginable. Wherever he goes there’s going to be a lot of expectation resting on him, and if he is to move, his new manager will be hoping that the dexterity with which he adapted to the Spanish league after moving from Portugal will help him settle in to another league. Saint-Étienne have had a dream season, and their surprising fourth-place finish will see them playing in Europe next year, for the second time since the turn of the millennium. Last time they qualified, for the 2008-9 UEFA cup, they were helped to a fifth-place Ligue 1 finish by Blaise Matuidi, Dimitri Payet and Bafétimbi Gomis, all of whom were eventually snapped up by bigger clubs and have now become Ligue 1 staples. Fans of the Stéphanois are justifiably worried, then, about losing this season’s star player. Not only has Aubameyang helped himself to 19 league goals, he also places pretty high on the assists table with eight—and this year has not been an outlier for the the Milan reject, who grabbed sixteen goals last season. The Turkish international turned up on many people’s radars after his Champions League performances–where he was the competition’s top scorer coming out of the group stages and scored the winning-goal in Galatasaray’s win over Manchester United. But he has a long pre-history of prolific scoring in the Turkish Super Lig. After two and a half seasons with Trabzonspor, he ended his tenure there with 58 league goals and took the sensible step up to Galatasaray. Trabzonspor fans loved this move so much that they welcomed him back by throwing firecrackers at him when he returned with his new club. Despite their remonstrations, this was a wise idea. Other European clubs were sniffing around, but Yilmaz was insistent on proving himself at a top Turkish club before leaving the country. And prove himself he has. Adding to his well-documented European performances is a 30+ goal season for the Turkish champions. Fans of clubs linked to this powerful Brazilian-international striker might take a look at his Wikipedia stats and wonder what all the fuss is about. “28 goals in 72 games? So what?”. What must be remembered is that the Brazilian domestic football calendar is carved up into two different portions, with two different leagues–the domestic league and the state championships. When taken together Damião’s return is boosted to 68 goals in 97 games. Compound that with 11 goals in 19 games in the Copa Libertadores—including one in the final which his club Internacional went on to win—makes him a very attractive prospect with a consistent and healthy strike rate. Hopefully for the big Geordie, Liverpool’s embarrassment at paying £35 million for him will have diminished significantly since last season’s window, meaning they’ll allow him to leave for a reasonable fee to a club where he’ll get first team football. Although haunted by injury for much of this season, he has been impressive for West Ham, if not scoring then creating, and reinvigorating his telepathic partnership with Kevin Nolan. West Ham are keen to keep him, and apparently, Newcastle wouldn’t mind getting him back. The 20-year-old Danish striker has had an explosive entry into domestic football, with eighteen goals in 34 games. On top of this he’s already a four-time-capped Danish international. Ajax, with their strong Danish contingent, must look attractive as a stepping stone for him. He’s been tearing up Austria’s Bundesliga this season, with more goals than games played. Not going to make a huge splash, but the 23-year-old striker might do well in Germany. Slightly older than the usual talent sniped from the Belgian Pro League, and slightly less well-known than his fellow countryman Falcao, this 26-year-old Colombian international striker has just been named Belgium’s player of the year. A consistently potent striker in both South America and now in one of Europe’s better leagues, Bacca made his first appearance in a European competition with three goals in seven in the Europa league. Again, he wont be making a big splash anywhere, but for a team lacking confidence in front of goal someone like Bacca would be a shrewd investment. Hamburg’s precocious 20-year-old South Korean-international striker has had another good season in the Bundesliga. When he was younger he was compared, perhaps prematurely, to Gerd Müller and had his praises sung by Franz Beckenbauer. A Hamburg first team regular since he was a teenager, Son isn’t the fastest, but he’s versatile, visionary and scores from all over the pitch. Even though he’s the main man at PSG, it still wouldn’t surprise anyone if he made a move this summer. He hasn’t won an English title yet, so City and Chelsea fans will be preying he’s a completionist. Anyone need to sell a load of merchandise? Buy this man! One of the great sagas of this summer—unless he subverts it by signing a new contract or pledging his allegiance—will be where Rooney goes. An interesting one. He’d benefit from another season at Villa—who pulled off something of a coup in getting him in the first place—especially since they’ve secured Premier League survival. At the same time, adapting to the league so quickly makes him an attractive buy, especially for a club who need a quick fix. This Sun headline sums up Villa’s position on the matter quite nicely. Fiorentina’s Montenegrin striker has been on everyone’s radar since his first season in Italy, and has since been linked to almost every top European club under the sun. Will some of the speculation finally ring true? Fiorentina have had a cracking season under the tutelage of former-Roma legend Vincenzo Montella, and will be playing European football next year after a fourth-place finish. With the hugely-talented Adem Ljajić and underrated Borja Valero behind him, he’s been La Viola’s top scorer for two years in a row. Any potential manager, though, will have to factor his injury record into their considerations. Unlikely to leave Chelsea, but will be playing for them next season, or back out on loan again? Tasty but expensive. This might seem like a redundant comment given that this applies to most of the players on this list—but Cavani—unlike some of the cheaper options—is already proven at the highest level. Needs no introduction, not even to Robert Mugabe. Liverpool, given their position going into this season, could have done much worse. But are they still attractive enough for Liverpool’s ‘false winger’ (as Brenden Rodgers has described him) to pledge allegiance? Hasn’t had a bad season, all things considered (perhaps with the exception of his transfer fee). Chelsea will likely be one of the clubs buying one or more of the strikers featured further up this list, so Torres’s opportunities to play are likely to be fewer. He has indicated his desire both to see out his contract at Chelsea and to play under Jose—but I’d be disappointed to see him relegated to third-choice striker. A blockbuster striker whose wages were too high even for Floriana—one of Malta’s biggest clubs—to pay. A trailblazer who paved the way for Emile Heskey to play in the A-League. A former England international. I hear Monaco are after him. Exactly which Monaco I’m talking about I’ll leave you to decide. This entry was posted in Analysis and opinion and tagged Andreas Cornelius, andy carroll, Burak Yilmaz, Carlos Bacca, christian benteke, edin dzeko, edinson cavani, fernando torres, francis jeffers, gonzalo higuain, Leandro Damião, luis suarez, mario gomez, Philipp Hosiner, Pierre-Emerick Aubameyang, radamel falcao, robert lewandowski, romelu lukaku, Son Heung-Min, stevan jovetic, strikers, transfer rumours, wayne rooney, wilfried bony, zlatan ibrahimovic by David Dodds. Bookmark the permalink.